The Converse Blog: Converse Wade 1 Reissued! Five-time NBA All-Star and 2006 NBA Finals MVP Dwyane Wade is currently having the best regular season of his career and is in consideration to receive his first-ever season NBA MVP award. The Miami HEAT Guard is currently leading the league in scoring (30.2 ppg), and registers in the top ten in assists (8th – 7.5 apg) and steals (2nd – 2.19 spg). He will also become the first player in NBA history to have 500 assists, 100 steals and 100 blocked shots in a season (NOTE: The NBA officially began to keep track of steals and blocks in the 1973-74 season). 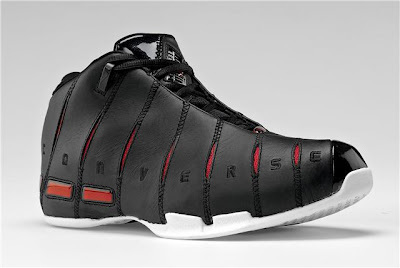 To celebrate this historic season, Converse will reissue a limited amount of the WADE 1. 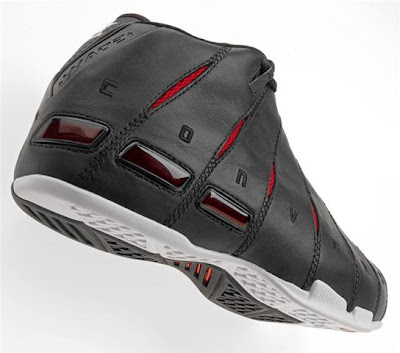 The WADE 1 was first launched before the 2005-06 NBA season and was the first-ever signature shoe for Dwyane Wade. He wore the shoe during a breakout NBA season where he led the Miami HEAT to their first-ever NBA championship and recorded the third highest scoring average in the NBA Finals with 34.7 points per game. The WADE 1 features “.08” displayed on the inner heel to reflect two game-winning shots in his first two NBA season seasons. His number “3” is shown on the shoelace eyelets and his name appears on the back and top of the shoe. Functionally, the shoe enables Wade to play at the top of his game with a Foot Strike Management System, internal sock liner and heel stabilizers. The WADE 1 will be available on Friday, April 10, exclusively at Champs Sports for MSRP $90. 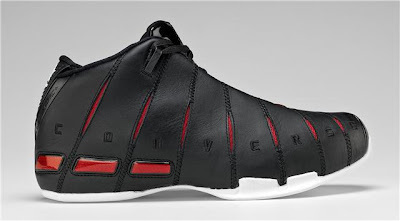 It will be available in the original, black/white/red on-court colorway. Champs Sports will support the launch with point-of-sale displays at locations across the country. If you missed these the first time around now is your chance you grab up a pair or two. As of a few minutes ago these aren't up at Champs Sports website yet. Happy Hunting! Nice shoe. Fitted like a glove. BTW, I looked for it but didn't see it mentioned. Marquette supposedly had a Converse Wade Slash PE version for the 2008-09 Big East Tourney. I tried looking for pics of them wearing it, but couldn't find it. Are you just teasing people? come on... Don't get me wrong but personally you make dwayne fans like me suffer so much. It's not fair I mean I love the shoes but it seems impossible for a small guy like me to get one. I just don't know what to do!. This is like frustration in it's highest level.. I feel aweful.. Are you guys happy now?